Ceramic braces: These are fitted to the front of the teeth, and consist of subtle, clear brackets with metal wires running between them. They are much less noticeable than traditional metal braces, and are ideal for patients who want to look good during treatment but who are not suitable for Clear aligners. They are also more budget-friendly than Lingual braces, making them a perfect compromise option. Lingual Braces: Fully Customized Lingual Braces are computer planned using 3D CAT Scanned images of your teeth. The brackets and braces are 100% customized for your teeth using CAD-CAM technology and the wires are shaped in 3 dimensions by a robot. Fixed appliances are attached to the inner aspect of the teeth to eliminate the aesthetic impact of wearing a fixed brace. Recent advances with the new Incognito appliance are now producing high quality treatment outcomes with improved patient comfort. This is the latest and most efficient generation of lingual braces, and these are suitable for more severe problems. Other Services: Teeth whitening, Scale & polish, Fluoride varnish application, Gum shield, Retainers etc. Invisalign Treatment “Nearly Invisible” Clear Braces: Invisalign treatment consists of a series of nearly invisible, removable aligners that are changed every two weeks for the next set of aligners. Each aligner is individually manufactured for the client’s teeth. What’s more, a virtual 3D treatment plan (ClinCheck© treatment plan) shows the series of movements which the teeth will go through over the course of the treatment. This allows the client to see upfront what his/her teeth are expected to look like at the end of the treatment. Unlike traditional braces, Invisalign aligners are comfortable, removable and nearly invisible, which means teenagers, can carry on enjoying life without the restrictions of traditional braces. STUDENT ESSENTIALS – Includes Metal braces for student under 18 who do not qualify under the NHS scheme at a reduced price. METAL BRACES – Includes the use of fixed stainless steel braces for Adults. CERAMIC BRACES – Includes the use of clear ceramic fixed braces for both adults and children. 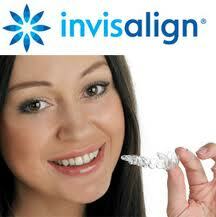 INVISALIGN – Includes various packages depending on the severity of malocclusion. Dental braces can correct crooked and crowded teeth, a misaligned bite, and jaw problems. Braces also eliminate problems you may have with eating, speaking properly, or with keeping your teeth clean. Traditional braces have come a long way over the years, becoming sleeker, smaller, and more comfortable. And that’s certainly something to smile about! Not all braces are metal. There are several options that are more invisible or at least transparent, and still do the job of straightening your teeth and aligning your bite. In general, clear braces and traditional metal braces function in the same way. Ceramic braces: Ceramic braces are made of composite materials. They come in varying levels of transparency so you can have ceramic braces that mimic the color of your natural teeth. The patient to the right is searing ceramic braces. Lingual braces: Lingual braces are metal braces, so they’re not invisible, but they’re attached to the back of the teeth versus the front. So when you smile, no one can see them. The following illustration shows how lingual braces work. Invisible braces, more commonly referred to as Invisalign clear aligners, are a set of clear, removable trays that are custom fitted to your teeth. You wear them for 20-22 hours a day and change your set as your teeth shift. Your orthodontist will evaluate your specific case and many types of bite discrepancies can be treated with Invisalign. Find out more about Invisalign clear braces. You and your orthodontist can discuss whether traditional braces or clear braces work best for you. Clear braces are more aesthetically pleasing than metal braces. Clear braces material is a bit more fragile than metal. Because of this, your orthodontist may make more gradual adjustments, so you may need to wear them longer. Clear braces require meticulous oral hygiene to remove any stains that may accumulate from coffee, tea, dark wines, or smoking. They can also cost a bit more than traditional metal braces. Are there Braces for Adults? Braces aren’t just for teenagers. Teeth can be straightened at any age. And now more than ever, wearing braces is much more efficient, convenient and comfortable. With the help of a Dental Associates orthodontists who works closely with your general dentist, you can get your smile straightened out. Learn more about Braces For Adults. Can I have coloured braces? It’s possible to add your own style to your traditional metal braces with colored bands. Show team spirit or celebrate a holiday with colored bands of your choosing! Learn more about Braces with Colored Bands. How long does a person wear braces? How to care for my braces? Throughout the course of wearing braces, you’ll need to take care of them. That means eating well and avoiding foods that are hard, crunchy and sugary. Eating too many sugary foods with braces can lead to plaque build-up around your brackets, and that could permanently stain or damage your teeth. Learn more about Foods to Avoid With Braces and How to Brush Teeth With Braces. Emergency care for my braces? Most times, when a wire or a bracket on your braces gets loose or breaks off, it’s not an emergency. Yes, it can be uncomfortable, particularly if a piece is rubbing up against or poking into your lips, gums, or cheeks. But, this is rarely an emergency and can be taken care of with a follow up visit to your Dental Associates orthodontist. Learn more about Orthodontic Emergency Care.